Attention students of FAU Davie — As of Friday, August 19th, 2016, Zipcar is available on the Davie campus! The Zipcar vehicle is located in parking Lot J, on the west side of the Student Union building and is parked in a designated parking space with a clearly marked sign. Zipcar is alternative to bringing a car to school. It gives members 24/7 access to vehicles parked on campus with low hourly ($7.50/hr) and daily ($69/day) rates that includes gas, insurance, and 180 miles per day to go wherever you want to go. Members can reserve cars online or with a smartphone for as little as an hour or up to seven days. More information can be found at www.zipcar.com/fau. WHAT: Pay for FAU Parking Citations with a non-perishable canned good. Canned food collected will benefit FAU’s Beyond Food Program and Boca Helping Hands. For more information and items to donate, please visit fau.edu/dean/beyondfood. WHEN: Monday, August 22, 8 a.m. through Friday, August 26, 5 p.m. Excluded Citations: Citations with a fee $50.00 or more (i.e. hazardous parking, fire lane, loading, reserved, disabled, etc. ); Citations for parking on grass/ sidewalk/ crosswalk, late citations. 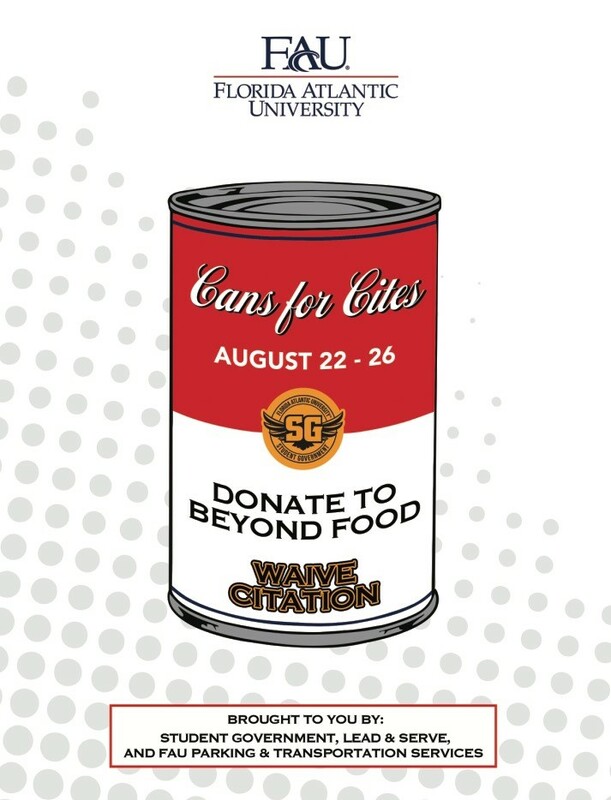 Any citations meeting the criteria and issued during the program dates must be paid off with the non-perishable canned good by 5 p.m., Friday, August 26. Valid for one (1) citation per student.